In spring, a naturalist’s fancy turns to thoughts of Timberdoodlin’, and that means heading out into the spring twilight, finding a brushy meadow, and listening for the buzzy “Peent!” of the American Woodcock (Scolopax minor) . AKA the Timberdoodle, this odd bird (it’s a shorebird that doesn’t live near the shore) performs a strange and stunning sky dance that is a must-see for any wildlife lover. Join the guys as they focus on the fascinating natural history of this bird and head out on a cold March evening to see if they can witness the Woodcock in action. Ep. 36 - Spring Science Geek Out! Spring is here, and the guys hit the trail to discuss spring-related science, including how climate change is impacting global plant growth and how it’s changing bird migration. Plus, Bill gives a (sort of) rebuttal to Steve’s unprovoked and vicious attack on Charles Darwin from last episode. Happy Spring! It’s Snow-and-Tell time! We’re deep into winter right now, and spring seems snow far away. So, we decided to embrace the season and look into recent research around a topic that would be sure to provide plenty of puns for this write-up: SNOW! We delve into recent studies about how much snow actually falls on North America, if the indigenous peoples of the north really have 100 words for snow, how climate change is affecting snowfall levels, and how those changes impact Snowshoe Hare populations (Lepus americanus) . Plus, in honor of Darwin Day, Steve insults the father of natural selection. All this, plus, we follow up on last episode’s cliffhanger, filling you in on the results of Bill’s Lyme disease test. Enjoy! Did you ever wonder why Downy and Hairy Woodpeckers look so much alike? No? Neither did we, but it was because we always assumed they were simply closely related species. Maybe you did, too, but thanks to the wonders of DNA analysis, we now know that these two look-alikes are not even in the same genus. So, what gives? Researchers recently looked into this stumper-of-a-problem, and, in this episode, Bill and Steve break down what might be the cause. Oh, and Bill talks about how he might have Lyme disease. This episode was recorded at the Owens Falls Sanctuary in East Aurora, NY on January 6, 2019. So said one enthusiast of the Hart’s-tongue fern (Asplenium scolopendrium var. americanum) long ago, and we think you’ll agree. This species is exceptional in many ways; its appearance (it doesn’t look like your typical fern), its uncommon habitat, and it’s rarity all add to the Hart’s-tongue fern’s mystique. This month, the guys hit the road, traveling to central NY and hitting the trail with Mike Serviss, a conservation biologist working with New York State Parks. Among his many duties, Mike is researching the most successful ways to restore this picky plant to its habitat, and he’s also a fantastic science communicator. Join us as Mike helps us peel back the mystery of what’s involved in restoring an endangered species. Have you ever heard of a burrowing crayfish? We hadn’t, until our much-smarter-than-us friend, Dr. Wayne Gall, shared the story of how he discovered one particular species living in western NY 30 years ago - Cambarus diogenes - the Devil Crayfish. Wayne invited us to join him on a hunt for this species, to see if it was still present at Tifft Nature Preserve, three decades later. Now, we invite you to come along with us, braving deep mud, crayfish pincers, and audio challenges (Tifft is lousy with the sound of trains, barges, and jets overhead). Along the way, Wayne proves himself a consummate storyteller, spinning the yarn of amazing coincidences that led to his connection with this species and publishing research about its presence in New York. We also give some visitors to the preserve a good scare. A big thank you to Wayne for his time, expertise, and persistence. This episode may be shorter than usual, but we want you to know that Wayne spent hours with us at Tifft, his arms buried in the mud up to his shoulder, searching for our target species. Imagine a gathering of nature-lovers where, for three days, you could attend hikes, talks, and other programs on dozens of natural history topics. Such a gathering takes place each year in Allegany State Park in southwestern NY. For over sixty years, The Allegany Nature Pilgrimage has taken place the weekend after Memorial Day, bringing like-minded individuals from across the country to share their knowledge of and passion for all things nature-related. 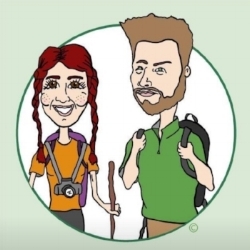 The guys were invited to lead a hike at this year's Pilgrimage, and, in this special bonus episode, you can listen in on what it sounds like when a big group of people join Steve and Bill for a hike in the woods. Our program was titled "The Skeptical Naturalist", and we focused on common natural history myths and some of the most interesting stories from past episodes. Enjoy, and we hope to see you at the Pilgrimage in the future! Nearly every year, somewhere in the eastern US, a brood of periodical cicadas (Magicicada spp.) emerges for the first time in 13 or 17 years. Each brood contains millions of individuals and it's probably one of the most spectacular displays that you would be lucky enough to experience. Before the episode, Steve and Bill traveled to Syracuse to see the tail end of Brood VII at a property owned by the Griffin Hill Farm Brewery. They recount that experience, explore the biology of cicadas, discuss why periodical cicadas live underground for so many years, and talk about the history and current status of brood VII. Enjoy! During this bonus episode, Bill interviews Gordon Maupin, former director of the Wilderness Center in northeastern Ohio and, along with Joann Ballbach and Gary Popotnik, the former host of "Wild Ideas...The Podcast". "Wild Ideas" was (and is) an excellent resource for information on natural history and it was a strong influence on our decision to start our own podcast after it ended in November 2014- less than a year before we released the first episode of The Field Guides. Enjoy the episode and "...as always, all you moms and dads, make sure your children get outside. Always great to let them go out there and roll over a log, turn over a rock. Make sure they get wet, muddy, and dirty, Just make sure they get outside and play." Have you seen the light? This month, the guys take their first foray into the world of fungi, specifically bioluminescent fungi! Although fireflies and other glowing critters have been well researched, fungi that glow are not nearly as well understood. Often referred to as "foxfire" or "fairy fire", their glow was first documented way back in ancient times, but researchers are still figuring out what it's all about. Join Bill and Steve as they shed some light on the latest research into these fascinating fungi. This episode was recorded in the Eternal Flame Falls section of Chestnut Ridge Park in Orchard Park, NY on July 4th, 2018.